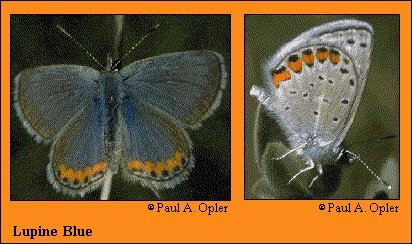 Identification: Upperside of male lilac blue with wide dark borders; female dark brown. Band at hindwing outer margin wide, orange-red, in male may be divided into separate chevrons. Life history: Males patrol near the host plants for females. Eggs are laid singly on flowers, which the caterpillars eat. Second-stage caterpillars hibernate. Flight: In the Sierra Nevada of California, one flight from June-August; elsewhere, several flights from March-July. Caterpillar hosts: Several species of perennial wild buckwheat including sulfur flower (Eriogonum umbellatum) and flat top (Eriogonum fasciculatum) in the buckwheat family (Polygonaceae). Habitat: Alpine slopes, mountain meadows and slopes, prairies, rocky outcrops, chaparral, and sagebrush. Range: Southwestern Canada south through much of mountainous and intermountain West and high plains to northern Mexico. Conservation: Several populations, some unnamed, are highly local, and are of conservation concern. Management needs: Monitor status of populations, conserve habitats, and be vigilant for effects of exotic weeds.